I have no clue where I got this stamp set- it is in my envelope of clear stamps that I got rid of all of the outer packaging in an attempt to create storage that was less bulky. I should have made notes on them with stickers..... 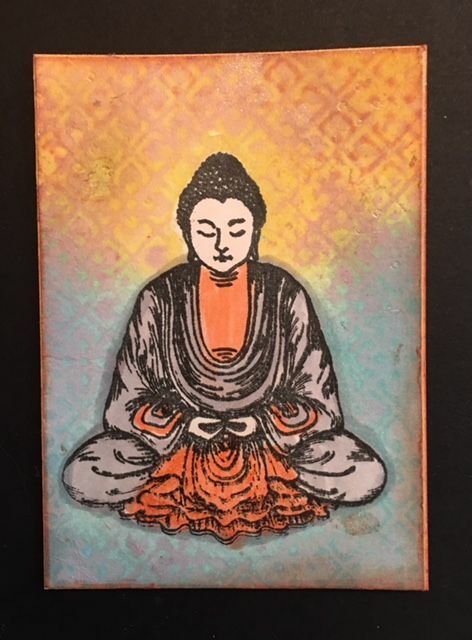 Anyway, I used an edge die (not marked with where I got this either), cut off the edge so the layers stay connected and made a one layer card. On the bottom layer, the outer dots were embossed, but not popped out. I stamped the image using Nuvo Hybrid ink and colored the image using Prismacolor pencils. I have not gotten them out for ages! The CYS group can be located here. List mom Barb had the brilliant idea- lets use our stash items- with a monthly theme, I am sure finding no shortage of items to use in my creative space for this challenge...!!! Even those in the 'get rid of' pile....... 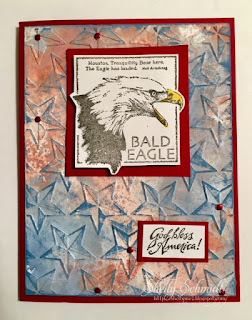 HERE is a link to all of the June cards at Splitcoaststampers for this challenge. I made a Sketch card for the AOSA Yahoo Group for a Sketch challenge. 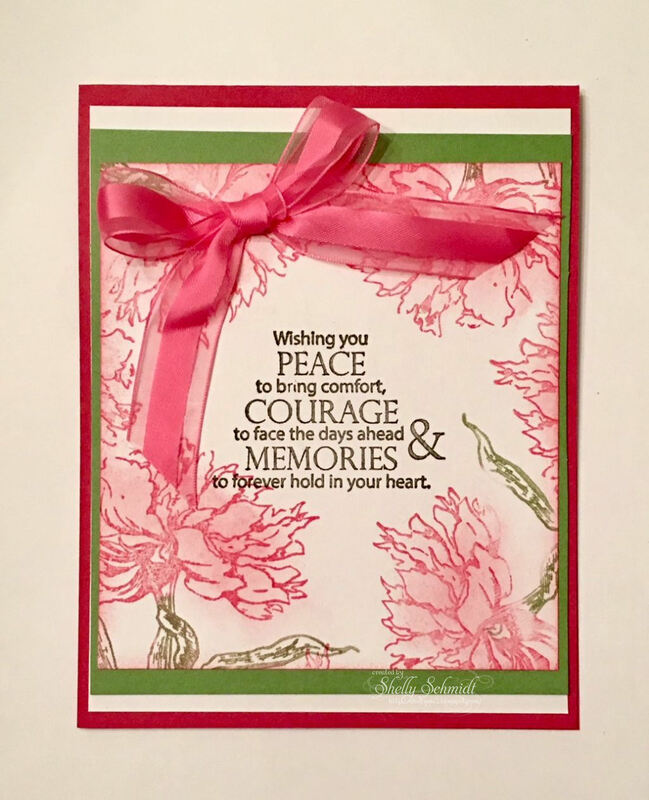 I used Washi paper and a pink SU cardstock that matched one of the flowers. 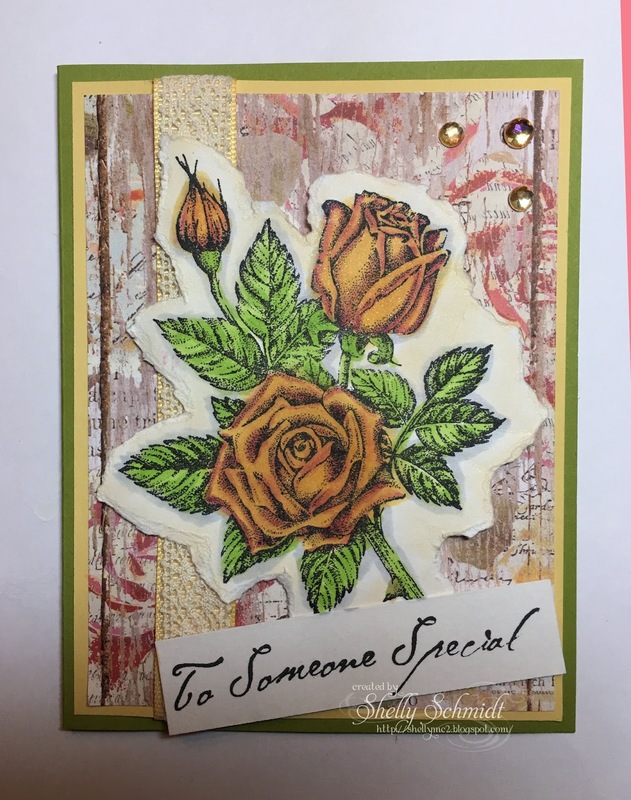 The image is Stonehouse Stamps. The circle stitch dies are Memory Box, the green layer cut is a Spellbinders die. 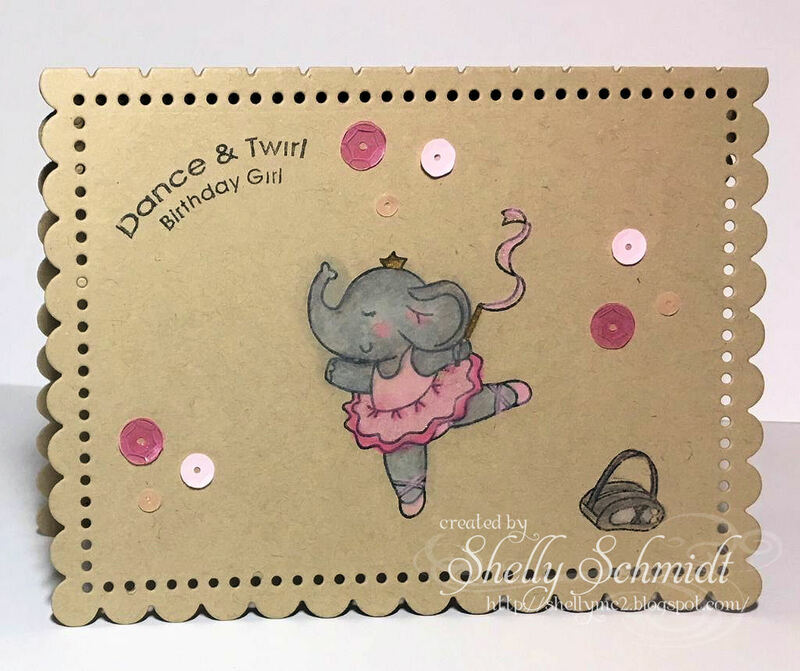 I embossed the pink cardstock and really like how the sketch turned out! I used Copics to color the image and cut her out using a die- the image had a couple of spots that were out of the die, so I cut them so they are 'Out of the Box'. ( I learned to call it that in the Technique Junkies group). 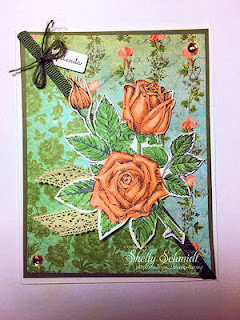 I used Groovy Guava SU (retired) cardstock with DP from Lizzy. The sentiment is from SU and punched out with the tag punch. We'd love to have you join us for the challenge! And, you may like to check out the other DT samples of shaped cards as well. You can find the challenge and DT cards Here! 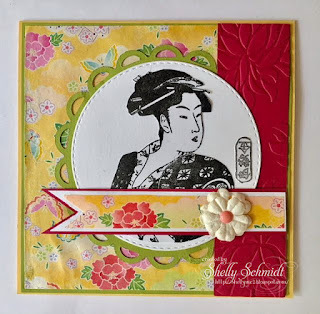 Each month, for the About Oriental Stamp Art Yahoo group , we make one Oriental ATC and send it to one individual who wins the random ATC lottery draw. In June, we had a theme of Purple and blues. The fan image is Just for Fun. 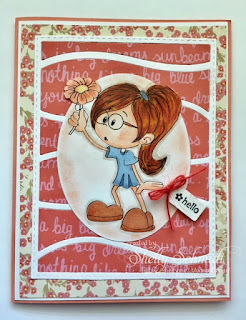 I stamped and white embossed the image, then colored it with Arteza waterbrush pens. I added score lines and then distress inks. I sponged on distress inks, and added color through a stencil on the top portion. For the June dual of the Dueling Darlings, Carol and I are the hostesses. We chose the theme everything is coming up Roses. I dug out an older SU image called Stipple Rose. I used Copics to color the images. My favorite images on cards are flowers. My favorite roses- are hard to describe- light yellow with peach or coral edging on the top. 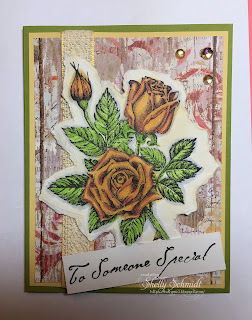 I needed another Sympathy card, so pulled out Unity stamps. 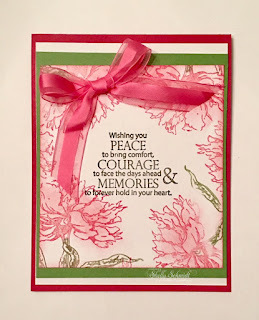 I stamped the sentiment first, then stamped the flowers in Rose Red (SU) ink, then sponged color in the centers. Since today is close to Memorial Day, lets chose a verse involving freedom. Scripture: Psalm 118:5. I will walk about in freedom, for I have sought out your precepts. 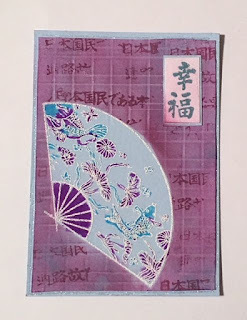 I pulled out the Distress Oxide inks, smooshed color on the craft mat in Brick and Blue Jean and then once dry, embossed and highlighted the embossing with the blue ink. 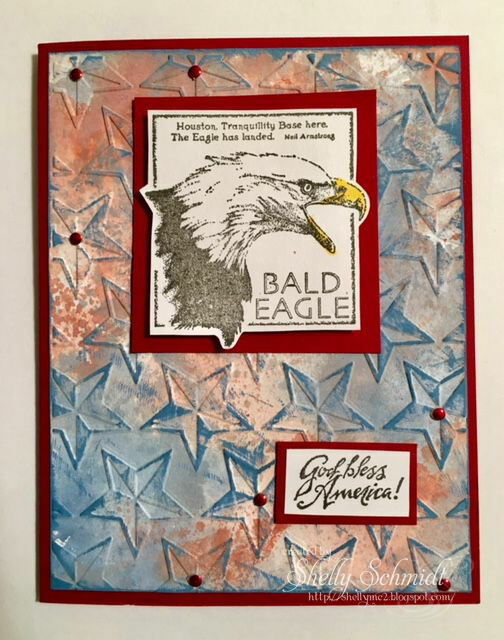 The eagle is by Coronado and the sentiment is Stampin Up. 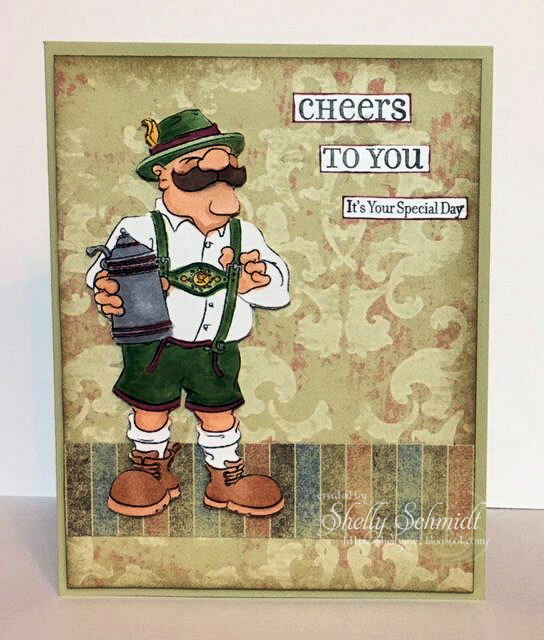 My husband's family is 100% German, so I could not resist this fun image! I hope to visit Germany one day! My G-grandfather is from the Cologne area. I stamped the image with Nuvo Hybrid ink and colored it with Copic markers. I fussy cut the image. I got out some ancient Su DSP and used it for the backdrop. The sentiment is SU- ancient as well.